War has arrived in Throvenland and the young princess Skara has been left the only one able to speak for its future. But can the remaining people of Throvenland plus the armies of Vansterland and Gettland, with their uneasy truce, hope to defeat the combined forces of the High King? 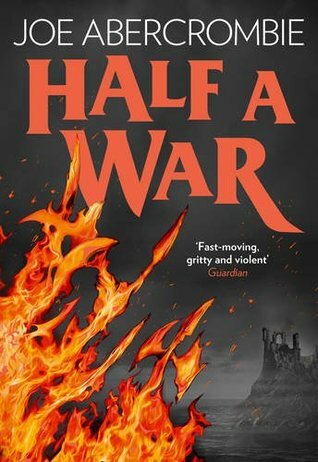 I really enjoyed the second book in this series, Half the World, but this third was, as the title suggests, all about war. It doesn’t make for particularly light reading. Everyone is out for revenge, but when it comes it only leads to an empty feeling. Plenty of people die in nasty ways, plenty of innocents as well as the hardened warriors. The characters are what makes this series special. In Half a King, we heard Yarvi’s story, in Half the World it was Thorn and Brand’s story and in this third book there are three points of view – Skara, the young Queen of Throvenland, Raith, a warrior of Vansterland and Koll, Father Yarvi’s apprentice. The stories all tie together and previous characters play parts in later books. Having three points of view in Half a War really allows the story to spread out more and see what’s going on in multiple camps, but at the expense of character development – each character gets a bit less page time, and we don’t always get to see the characters grow. I really thought that Half the World was the better book in this trilogy, but it’s well worth reading all three to round out the story. There’s plenty of room for more stories in this world, but this book had a very satisfying ending to it – all the pieces slot together and most people got mostly what they deserved. Read this series if you like Game of Thrones or other gritty high fantasy.